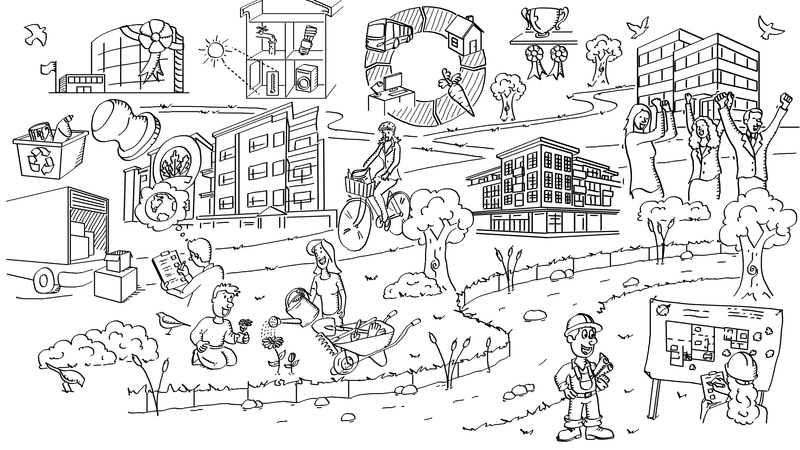 Project objective: To create for BC Housing 12 short hand-drawn video segments to be embedded in their livegreen video: Greenest Employer 2016. To create a collage using all the drawings to include at the end of the video. About Livegreen: The livegreen Housing Sustainability Plan: 2016/17 is one of BC Housing’s most important planning documents for addressing climate change by reducing greenhouse gas emissions and demonstrates their commitment to sustainability. More information on BC Housing’s website. Video making process: The video was produced by Kevin K Li from Little Ram Productions Inc. for BC Housing. Our role was to create the speed-drawing video segments. To do that, I sketched each one of the 12 illustrations according to the video script and guidelines from BC Housing. Once the drawings approved, I recorded them in video as usual, drawing on my screen while recording it as a movie (see my video “inside the creation of a whiteboard video” for more details). All the footage was then sent to Kevin K Li for editing. Finally, I combined all the drawings used in the 12 sequences into one big collage and delivered a large PNG file (see image below) to be used at the end of the video.